The new Tablets line by Marcato offers the chance to easily and rapidly make perfect home-made ravioli. Its cutting precision and the quality of its components make it a unique product of its kind. 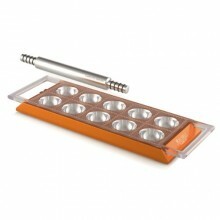 It consists of three parts that are easy to clean and a resilient anodized aluminium rolling pin. Click the button below to add the Marcato Ravioli Tablet copper made in Italy to your wish list.